In our underwear/overwear line, a real French Country Provincial petticoat! 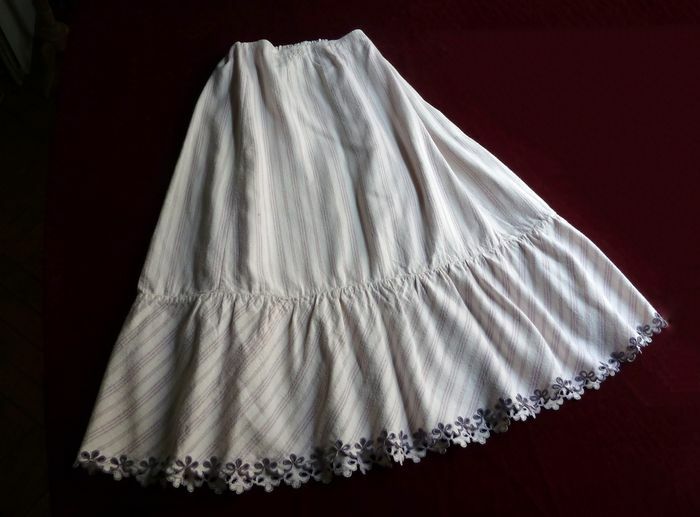 This charming piece is made of soft white cotton flannel with blue and lavender ticking stripes that run horizonally in the body of the skirt and diagonally throughout the bottom flounce. The flounce, slightly gathered to add fullness, terminates with a pretty, curlicue scalloped border hand embroidered in lavender grey thread in an open-work three leaf clover pattern. The waistband is fully adjustable from a maximum opening of 46in. and cinches to fit with cotton ribbons that tie in a bow. A discreetly pretty monogram, "CE," is embroidered in white thread in the front just below the waistband. Likely dating from the early 20th century, this pretty petticoat is in as-new, impeccable condition! Dimensions: overall length 33in., circumference of skirt flounce (at widest point) 45in., waist: adjustable with drawstring to widest circumference of 46in.